If you’re looking for the right Active Directory tools, you will find what you need with mPowerTools - the ultimate IT administrator’s tool for handling everyday Active Directory maintenance. Designed for administrators who want to tackle IT chores in bulk, mPowerTools streamlines the configuration and execution of common IT administrative tasks. An efficient and flexible Search and Replace engine eliminates time spent manually digging through Active Directory to find and change information. And, with the release of mPowerTools v6.0, you can now find and report on all the Group Policy Objects in your network; where they are linked, their status, who has permissions over them, and more. 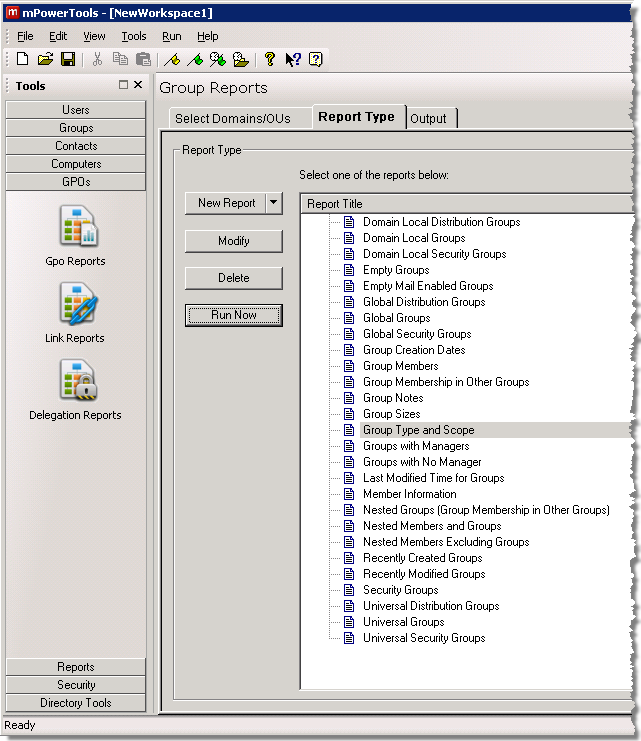 The mPowerTools new GPO reporting tool finds all of the GPOs in your network and tells you where they are linked, their status, who has permissions over them, and more! 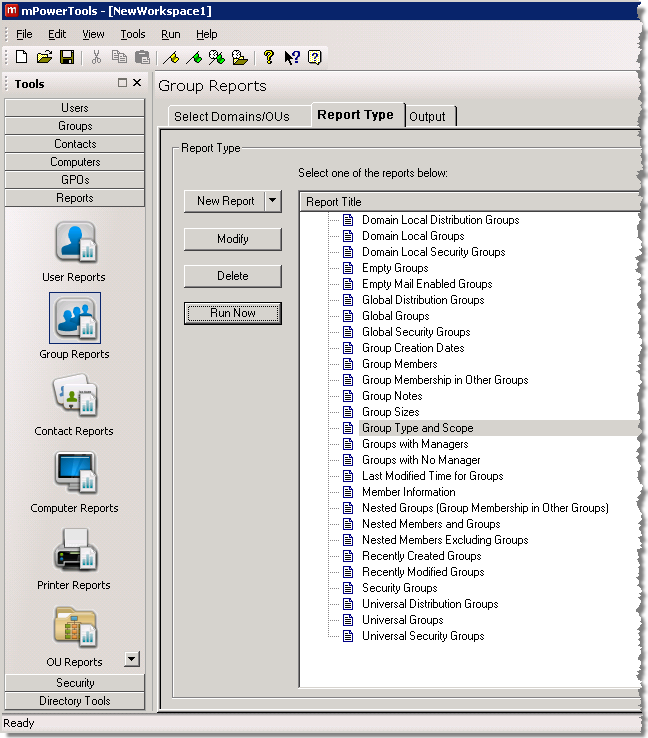 Three new GPO reporting tools and more than 25 GPO reports are available now in v6.0. Whether you’re adding users, deleting or disabling user accounts, resetting passwords, modifying AD attributes, or configuring Exchange mailboxes, mPowerTools does it all in a snap. 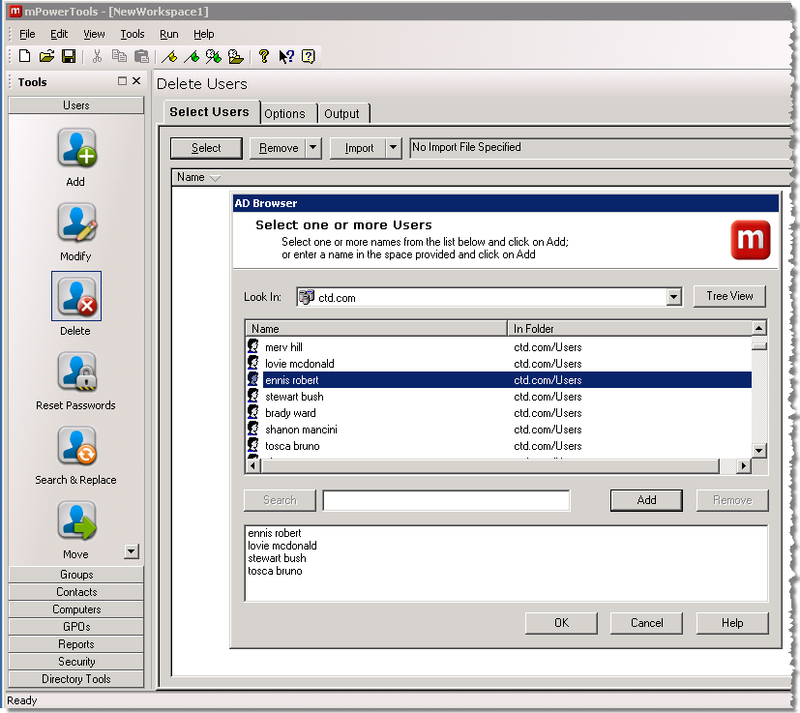 This tool allows you to import user names from various sources such as spreadsheet files, or from the built-in Reporting Tools, and you can always use mPowerTools to browse through Active Directory to select users. mPowerTools offers more than 200 pre-configured reports that can be customized, enabling you to easily construct and filter data in AD. mPowerTools provides several standard reports that can be customized to fit your environment, or you can create your own reports from scratch. You’ll never need to use scripts or third-party reporting tools again. Administrators and networks aren’t always free at the same time. mPowerTools allows you to perform tasks when it’s convenient for you, and then schedule those tasks for distribution over the network during off-peak hours. 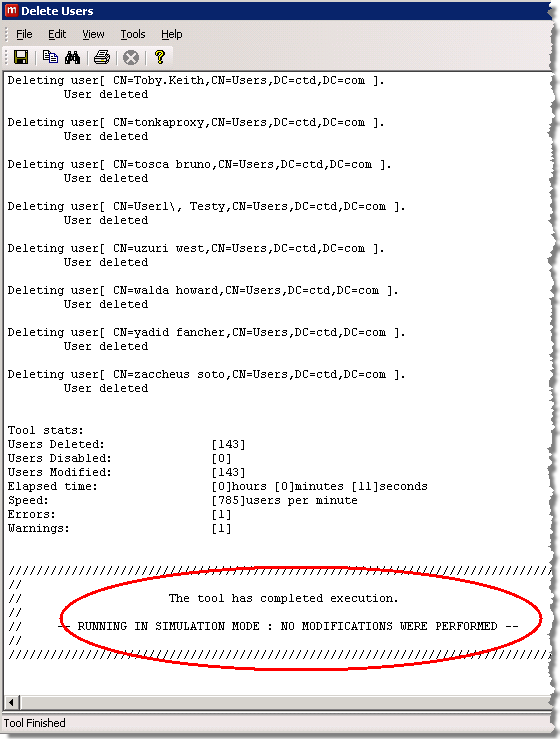 Logs created during execution confirm the tasks were performed. mPowerTools' simulation mode allows you to validate all of your data before a job is executed. If there is an error in the data, the cursor will move to the erroneous field and a warning message will be displayed. Designed to expose problems such as incorrect access rights, without actually performing the requested action, mPowerTools ensures that no errors will occur when the task is executed. 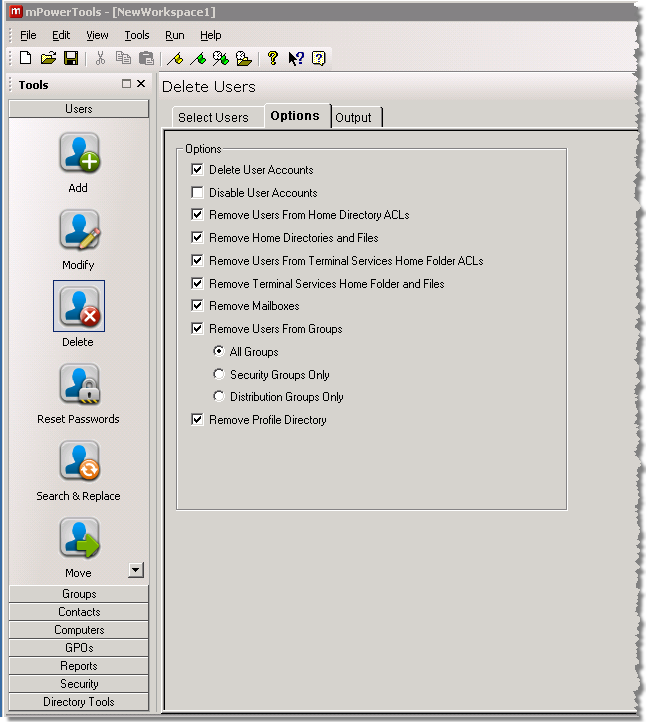 mPowerTools provides the user with a Tools Selection Bar that identifies tasks such as Add User, Reports, Delete User, and Reset Password. 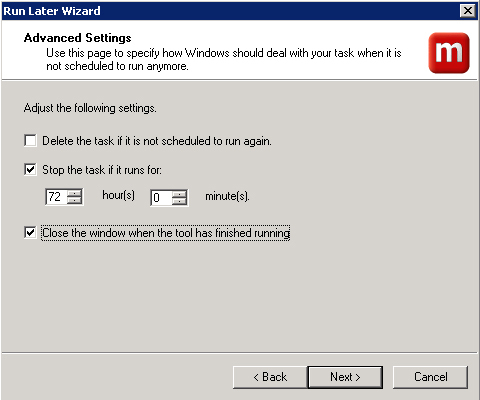 By selecting the appropriate tool and saved configurations, the user has little to do prior to executing the tasks, streamlining the entire process. Whether you’re adding users or resetting passwords, mPowerTools provides you with a simple, secure interface to delegate your most common tasks, freeing up your skilled administrators. You can rest easy knowing that the interface locks down tools and fields, allowing only the tasks you delegate to be executed. You can even set mandatory entry fields, ensuring that all pertinent information is entered for every task. And, for troubleshooting later on, you’ll be able to retrace all of the steps taken through event-driven audit logs.